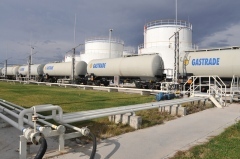 At the end of 2012 Gasdrade SA became a partner with Gazprom Neft. 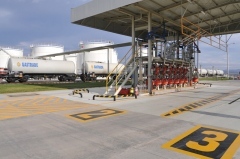 Gasdrade SA sold a perfect part of its warehouse base for storage of LPG and liquid fuels- Kostinbrod of Gazprom Neft. 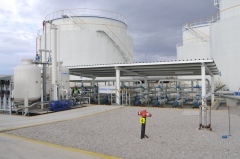 Gastrade AD remains the operator of “LPG storage facility” with its propane-butane tanks (24 x 400 m 3, with a total geometric volume of 9600 m 3) and the adjoining facilities. 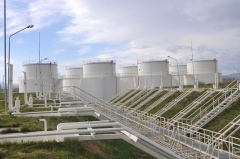 “Gazprom Neft” becomes an operator of “Warehouse for Liquid Fuel ” with the liquid fuel tanks and the service facilities in it. 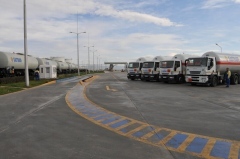 The “LPG storage facility” with operator “Gastrade” SA is a licensed excise tax duties warehouse. Pumping station: 3 pumps and 2 compressors. Underground tanks 3x 50 cubic m. – biodiesel, bioethanol, premium gasoline. All tanks are built with double bottoms and double walls complying with latest EC standard and equipped with floating roof.